The book Home – Timeline is about places that were or became my home with their timeline. 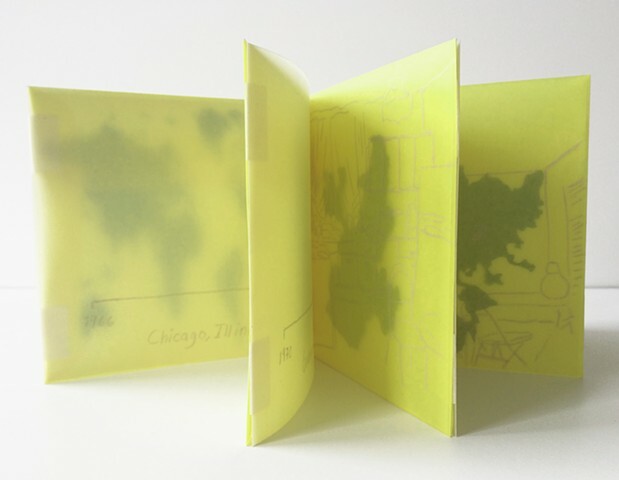 In white square translucent pages is the name and timeline of four cities I lived and between the pages there are square yellow translucent envelopes containing a cutout map of each city with drawings in the cover that represent home. One envelope has the world map; being the beginning or ending of the book. If the book is extended it becomes circular for the way it is attached. The book can be seen in multiple ways, adding a different meaning depending how it is displayed.